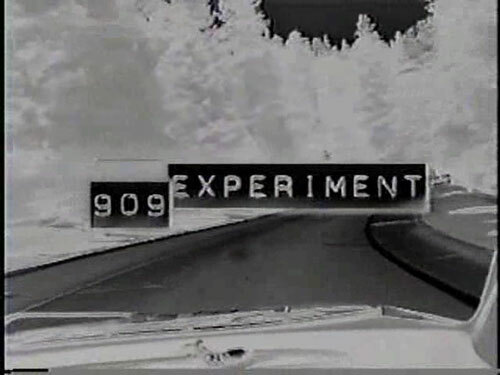 It’s quite possible that you haven’t heard of ‘909 Experiment’ – I hadn’t heard of it until a few days ago when I was looking for information about ‘Das Experiment’ online. 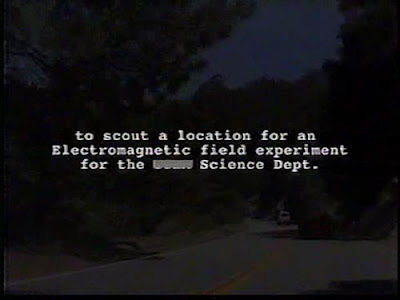 It was made in 1999 as an attempted Blair Witch cash-in, and the plot concerns two young people who head into the woods in order to take part in an ongoing university project about creepy goings-on inside a mountain chalet. The creepy goings on are that the guy dies and the girl doesn’t. I wish what I’d just done there can be called spoiling the movie, but like all the films I cover here for the ‘How to Ruin Your Own Movie’ feature, 909 Experiment is hell-bent on spoiling itself from the earliest scenes. That’s Jamie. Just one minute into the movie we see her being interviewed after the main events of the film. So she gets out just fine. And she only refers to the other character “Alex” in the past tense. So obviously he’s not long for the world. The strange part of the film is how utterly superfluous the later interview footage is. Over the course of five minutes worth of interviews Jamie will reveal absolutely no information the audience needs, or even finds mildly interesting. Honestly, the only purpose served by these interludes is to pad the running time out to a barely-feature-length 80 minutes. Of course, when you consider that the first eight minutes consist of the characters driving up to the cabin while a horrible song plays on the soundtrack and absolutely nothing occurs, it’s really only a 72 minute movie. Hell, the desperate clawing for minutes that the interview segments consist of get oddly sad in the second half of the film, when it becomes clear that the writer/director ran completely out of ideas, and just resorts to having the actress playing Jamie describe things that have just happened, or spoil things that are about to occur. A list of instructions telling them what their duties are for the next two days, namely hanging out, seeing if anything creepy happens, and keep a detailed log of their experiences. 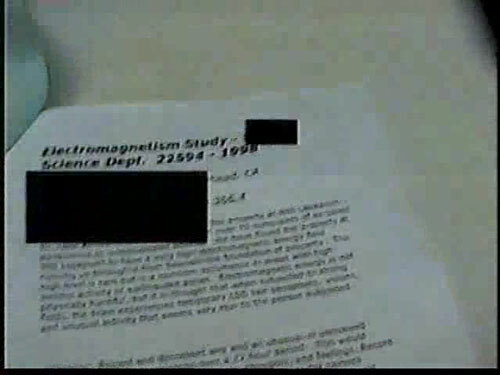 For taking part in the experiment, they’re offered three hundred dollars to split between them. Although Jamie probably got to keep the whole thing after Alex’s death. Among the film’s lowlights are terrible acting, horrid pacing, the most boring debate about spiritual faith you’re ever likely to hear (seriously – who wants to listen to inarticulate people struggling to describe their poorly-thought-out positions?) and the tedium that comes from watching a film shamble towards a foregone conclusion. This is a movie from filmmakers who seem to believe that the ability to tie a fishing line to lamps and glasses is all you need to create ‘scares’. Honestly, there are only two interesting things about the movie – the first is the conceit of this being found footage, which necessitates the elimination of anything they couldn’t secure the rights to mention. The location of the house is redacted, the name of the doctor in charge of the experiment is bleeped, even a soft drink bottle has its name obscured by a black box. 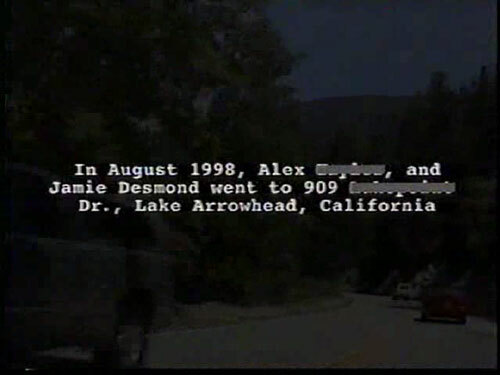 Of course the film even manages to botch this concept – as you can see above Alex’s last name is covered up in the title card, and goes unmentioned in the film, which just doesn’t make narrative sense. It raises the suggestion that someone existed who objected to Alex’s name being used in the movie, but didn’t object to his likeness appearing? Or had no problem with the movie going forward at all? After all, were this a real film Alex’s death would be public record, and his identity would be simple to uncover. So what would be the purpose of redacting his name in the credits, when the very fact of the events being presented on video makes his identity public? The other noteworthy portion of the film is unrelated to the filmmakers’ intent or abilities, and it would not have warranted mention just one year ago. It is the film’s odd similarities to Paranormal Activity. Beyond the extremely similar premise and central conceit (a-hole disbelieving jerk carrying a camera around documenting scariness and annoying his believer girlfriend) a key scene in the film involves Alex sleepwalking down through the house, disappearing into a room without camera coverage, and returning with a butcher’s knife. It’s the film’s one really effective sequence, and it isn’t dulled any by familiarity among those who’ve seen PA.
Additionally odd after the success of PA? The fact that the characters keep saying ‘Paranormal Activity’ over and over again to describe the situation. Seriously, though – a couple of weird coincidences and one effective scene do not a watchable film make. Even if this does someday get a wide release, it’s profoundly not worth watching. And ‘909 Experiment’ is an unusually bad title. Just saying. I would just like to point out something. Had you have done your research on the movie properly, you would know that this was made before Blair Witch Project, making your 'cash in' comment void. Secondly, you failed to mention, in your comparison to PA, the reason that this movie has actually creeped out of the unknown. The director believes the premise for PA was actually taken from this movie, perhaps after seeing one of the odd copies floating around Hollywood from it's one, and only, screening many years ago. I'm curious as to how you found this film actually? 909 Experiment is not a released film. The 0NLY way to "review" it would be done by illegally downloading a torrent copy of an unfinished film. To start off; commenter Wayne, I assume you're the man behind the film. I wanted to apologize as I too downloaded it from a torrent.... how is anyone supposed to see it!?! To be honest, I liked the movie. I thought it had an interesting plot. I just want to preface my comments without saying that I haven't seen either PA movies as yet, but rest assured, I also downloaded them from a torrent. As far as the movie is concerned; you said it was an unfinished film. What was supposed to happen next? I assumed, while watching the movie, that we would see an interview with the person who had the 'hidden cameras' set up to record the goings-on. I think that would have added to the believability factor and make it seem even more like a documentary. I will say, while the 'shaky camera' mode may add authenticity, it gets tedious and ultimately dreadful when overused... not that I'm saying in this case, but Blair Witch was almost unwatchable after a few minutes. I'm sure some people had seizures while watching that movie. I know it's been almost a year to the day since you posted your comment, so it would be interesting to hear your thoughts in hindsight. I enjoyed the film. I hope the torrent makes it popular enough that the the producers will consider releasing the film. I thought it had dreamlike elements: a house with a multitude of doors some locked some opening by them selves, the gun in a box filled with door knobs, the dialogs along with the stumbles seem like the effects of something electric magnetism, or gas leaks or natural meth or other toxic gases? (The headache, trouble speaking, laughing etc) Its an earthquake zone I think so earthquakes and paranormal objects shifting could go together. Aside from PA it reminded me of the 1970's film the Entity too. It seemed like every prop and conversation had meaning and was intentional by the director. It was a trip down the rabbit hole. The only part I was wondering about was the scouting vs being in the experiment. I didn't get that either. I love re-watching the film and try to catch what ever else the director wanted to convey. Wayne did you do any more movies or books? Great stuff. Maybe torrents can become a venue for movies outside of Hollywood. (Because of the torrent I think I'll post anonymous too. Is there a web page for Wayne? The only part I was wondering about was the scouting vs being in the experiment. I didn't get that either. I love to re-watch the film and try to catch what ever else the director wanted to convey. actually, i'm going to assume that wayne is not the director. i reviewed this film on a youtube channel years ago and the director contacted me and thanked me for bringing some publicity to it. he really doesn't care if you pirate it as it's not released and he's not losing any money, just gaining attention through the only way he can. so pirate away, mateys! I’m unclear on what The Collector’s plan was. Sherlock Holmes is a profoundly dumb movie. V continues to surprise me with its idiocy. A note on the subject of Castle Vardulon.